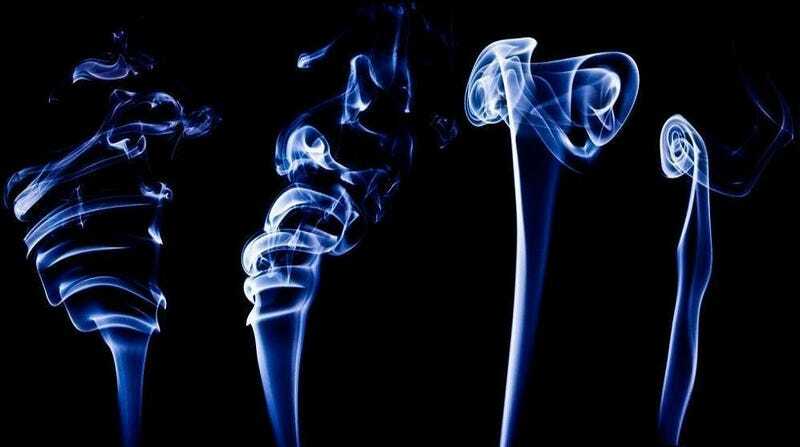 This is what you see when you light a stick of incense, you just don't know it. A project sponsored by the Czech Ministry of Education makes smoke into flowers and creates trees out of magnets — and then photographs them all. All you need is smoke, a light to illuminate it, and a very good camera, and you can also make lilies out of incense smoke. These are a few pictures of the smoke from an incense stick forming flower-like flutes and rope coils as it rises up. The project that made these photos also deals with things like turbulence in smoke coming off a larger surface, drops forming geometric patterns in milk and coffee, and trees made out of magnets. See? I wasn't kidding. Fine particles of metal are poured on the magnet. They magnetize to form filaments of metal, but each strand repels the strand next to it, so when they all crowd around the magnet they form a kind of shaggy palm tree. There are smoke and liquid vortexes and some amazing pictures of waves forming on oscillating liquid — all of which show that physics can be beautiful in the traditional sense, as well as the intellectual one.